During Sunday’s Old Timer’s Day, tales of the Yankees legends resurface, many paying homage to the great players of their franchise. 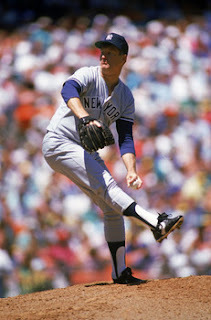 Tommy John, who pitched eight of his 26 major league seasons with the Yankees, shared how he was given the royal treatment by Mickey Mantle during their first big league encounter. John only lasted one-third of an inning on May 8, 1964, with manager George Strickland pulling the 20-year-old after one more batter. It was certainly a learning experience for the young lefty, but it was not the last time they would meet. Fans and players alike speak of Mantle’s prodigious power with the bat, but often overlooked was Mantle’s blazing speed. Plagued by leg injuries throughout his career, Mantle wrapped his legs from his ankles to mid-thigh just to get on the field. Despite his ailments and the advanced stage of his career, John noticed that when the game absolutely necessitated it, Mantle could summon the speed of his youth.